By my own admission, I'm not the best when it comes to healthy living. I like chocolate, red wine, meat, cheese, croissants and copious amounts of black coffee. None of these feature anywhere at the top of any "good foods" lists (though surely, since wine is made of grapes, it counts towards your five-a-day, right? ), but cutting them out completely would rob me of a big part of my 'joie de vivre'! There is of course another way. As I'm not prepared to say 'non' to all of the above, I need to find a balance by adding some of the good (for your health) things to my diet. I juice, drink some herbal teas, eat my greens and fruit. And I like smoothies. A good smoothie is like a whole meal in one single glass and the fact that I can simply throw all the ingredients into a blender and have breakfast ready in about two minutes makes them perfect for busy days. So, with all that in mind, when Alpro asked me to take part in their AlproAM challenge, I was more than happy to oblige and share seven smoothie recipes which are healthy and tasty (yes, really!). All these are made with fresh fruit or veg and are combined with Alpro Almond to complete them. Here are the first four, the next ones will follow before the end of the week. Below are the ingredients listed and all you need to do is put them in a blender and whizz until smooth. The only exception is the carrot juice which I made in a juicer, though it would be ok to buy some. 1 cup of fresh blueberries, 1 banana, 1 cup (250ml) of Alpro unsweetened Almond milk. 2 tsp Matcha Tea disolved in 2 tbsp hot water, 1 banana, 1 cup (250ml) Alpro Almond Milk, 2 tbsp desiccated coconut, 2 tsp honey. 1/2 cup carrot juice, 1 banana, 1 cup (250ml) Alpro Almond Milk, small piece of ginger (grated or juiced). 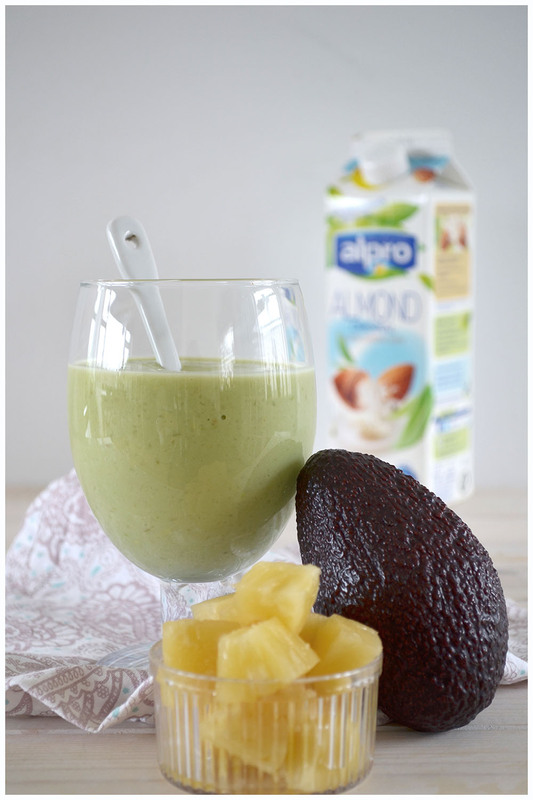 1 avocado, 100g pineapple, 1 1/2 cups (375ml) Alpro Almond Milk, 2 tsp honey.